Scientists in Hungary on Tuesday protested government efforts to take control of their research funding, a move they say endangers academic freedom. Several thousand people formed a human chain around the headquarters of the Hungarian Academy of Sciences, urging the academy's leaders to fight the government plan and hold onto their independence. 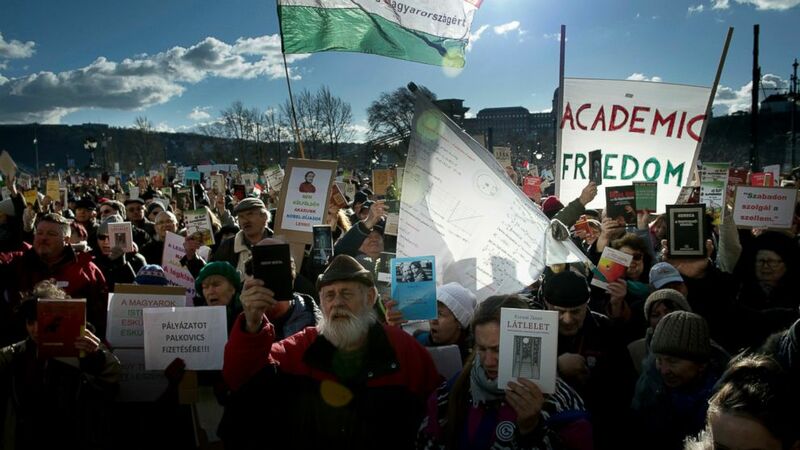 Researchers at the protest handed a petition to academy president and renowned mathematician Laszlo Lovasz, asking him to support keeping their research institutes under the academy's management. The academy oversees some 5,000 researchers in a range of disciplines, from medicine and economics to computer science and astronomy. Populist Prime Minister Viktor Orban said the government's aim is to improve innovation in scientific research and to have publicly funded research projects create "a direct economic profit." "International innovation rankings show that, unfortunately, Hungary's place is among the weaker performers," Orban said Tuesday in an open letter to researchers. "Our ability to enforce our interests in obtaining significant scientific and innovation funds could be stronger. So in this case, a responsible government has to act." But scientists fear the new financing system being pushed by the Ministry for Innovation and Technology — which takes away basic funding for the research institutes and forces researchers to compete for funds for specific projects — will seek to impose political and ideological goals on their scientific work, while curbing their long-term financial and professional security. Researchers also fear the government could eliminate institutions dedicated to the humanities and social sciences, where direct economic profits may be harder to demonstrate. "If, after all, we yield to the will of the ministry ... then there's no question that our community will lose its cardinal value, its independence," said Adrienn Szilagyi, a researcher at the Institute of History. Marton Zaszkaliczky, a research fellow at the Institute for Literary Studies, said the Hungarian government is trying "to control every possible institution in the country." Late Tuesday, the academy mostly stood its ground, while also showing willingness to compromise. By a majority decision of its board, the science academy said research institutes would be able to take part in the innovation ministry's new "program of excellence" research tenders, but only if Minister Laszlo Palkovics guarantees in writing that the academy's 2019 funding from Hungary's state budget is restored. The academy also said it wanted to discuss the minister's proposals regarding the future of the research institutes. Orban's government has intervened in academic issues before. In December, Central European University — founded by Hungarian-American billionaire and philanthropist George Soros, whom Orban considers his main ideological foe — said it would move most of its programs from Budapest to Vienna because Orban government's was unwilling to sign an agreement guaranteeing its operations. Since returning to power in 2010, Orban has greatly centralized power and increased the state's role in many walks of life, from the economy and the arts to sports and the media, while also enriching his ideological and business allies through generous state contracts. In December, Orban exempted from competition rules a giant, pro-government media conglomerate that controls some 480 publications, renewing concerns about media pluralism and press freedoms. Orban's zealous anti-immigration policies and frequent conflicts with the European Union over the rule of law and democratic values have won him populist admirers inside and outside the country. He was elected to a third consecutive term in April.